Snail Mail Collective round 3 was a hit! I was paired with the sweetest girl from Australia named Naira. 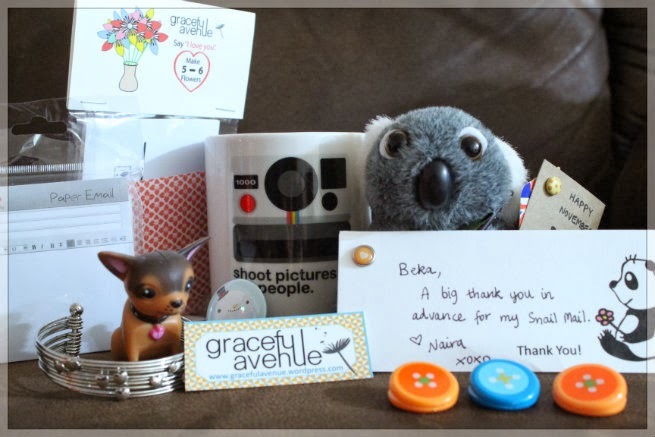 She blogs over at Graceful Avenue and has an adorable on-line shop where she sells some beautiful cards. For those who haven't heard me talk about Snail Mail before it is an International Package Exchange. You sign up and then are paired with a partner where you can e-mail and get to know about them and their country better. The package is limited to $5, you don't have to be a blogger, and you can sign up month per month. It's a win win all the way around. If you would like to sign up you can do so by clicking here. This month Naira sent me the following along with an explanation of why she sent each item. This was such a thought out package and I loved it! Thanks a bunch Naira!